This website is a celebration of the career of Mats Wilander from 1982 to 1988 - seven glorious years during which he won seven Grand Slam titles, and was always in the top five. The sections listed above cover that 1982-1988 period, and also include items that appeared a year or two later. The "Links" section contains details of websites that will be helpful for those who want to know what Mats is doing these days. This is not an official website. I am a lifelong fan of Mats Wilander, but I have never had any contact with him. 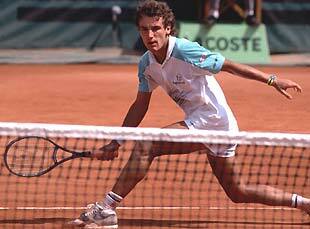 This picture shows Mats on the way to winning the 1988 French Open. For the full range of photos on this website (including clear images of the items at the top of this page) please see the "Photos" section.